These free shipping H4 LED headlight bulbs adopt the newest technology in 2015 from CREE and Philips, with two types of light source of CREE XHP50 + Philips Luxeon MZ, which output 3000 lumens each bulbs. The H4 LED headlight bulbs 6HAIOH4 are the 6th generation. They feature with interchange 5 colors: 3000K, 4300K, 6500K, 8000K, and 10000K. Change of colors by color films. They are easy to install, plug and play, no need of ballast or fan. 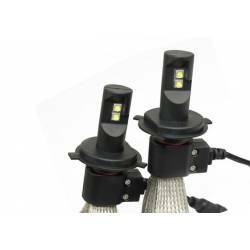 Our free shipping H4 LED headlight bulbs are with very great heat sink function, it is unnecessary to use fan or heating bell, life span of these LED headlight bulb H4 conversion kits can be prolonged. They are suitable for high temperature environment. TruFirst free shipping H4 LED headlight bulbs are fully waterproof with IP65. Our LED H4 headlight bulbs 6th generation comes with 3 years warranty.